Video poker is an exciting game of pure chance and skills and therefore, players can increase their chances of winning by using a reliable strategy. However, the first step towards mastering the game is to know its basic rules and winning combinations. 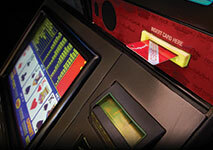 Video poker appeals to a huge number of players due to its interesting nature and simplicity. The game is suitable for all types of gamblers, regardless of their style of playing and experience, as its basic rules are fairly simple to learn. Video poker is one of the most exciting casino games which has a number of interesting variations. Thanks to this huge diversity of video poker games, players have the chance to choose the one that suits their personal preferences best and fully enjoy themselves. The classic game, along with some of its most popular versions, can be found pretty much everywhere – in various casinos, bars and even restaurants. Nowadays, it is also possible to play video poker on the Internet as almost every online casino offers it. The game can be found in so many places that the chances that players will bump into it at some point are quite high. Thus, why not get familiar with its rules in advance in order to be able to enjoy it when possible. It is worth mentioning that even though the video poker machine resembles to a huge extent the slot one, both games are quite different. Slots require only luck, whereas video poker is a game of both luck and skills. As already indicated, the basic rules of the game are moderately easy to grasp. 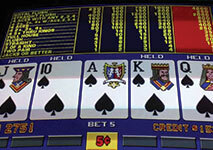 In video poker, players have the opportunity to choose from two options for every card they get. It is possible to either hold or discard the respective card or cards. If they happen to have a winning combination, they get paid according to a pay table. Therefore, if players use an efficient strategy, it is possible to significantly reduce the house edge and win in the long term. The whole gaming process is also quite simple and it can be summed up in a few stages. First, players need to place their bet which in most cases, can be from 1 to 5 coins. Then, the machine deals 5 cards and this is the time when they are required to make up their mind about every card in their hand. In case that they decide to discard a particular card, it will be instantly replaced with another one, just like in a 5-card draw poker. Once players are done with this process, their hand value is compared to the winning combinations and if they have managed to form any of them, they get paid accordingly. The winning combinations are preset and vary, depending on the particular version. A winning hand is usually a pair of Jacks or better, but certain variations such as Tens or Better have lower minimum winning combinations. The different hands in video poker are ranked in the same way as they are in the standard poker. However, some of the winning combinations differ from one variation to another and it is recommended if players have a look at them in advance. 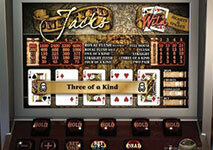 The most popular versions of the game that are offered by most casinos use the “Jacks or Better”system, meaning that a pair of Jacks is the lowest winning hand. Since this is the most popular system for video poker, let’s have a look at its possible winning combinations. The top hand that players can form is a Royal Flush which consists of a King, Queen, Jack, Ten and an Ace of the same suit. The second best hand is a Straight Flush which consists of five consecutive cards of the same suit. The third winning combination is Four of a Kind that consists of four cards of the same rank. Full House is the fourth best hand that consists of three cards of the same rank as well as two other ones that are ranked differently. The sixth winning combination is a Flush and it consists of five cards of the same suit which are not necessarily consecutive. This combination is proceeded by a Straight – five consecutive cards of different suits. The next hands are Three of a Kind which consists of three cards of the same rank and Two Pair that is comprised of two pairs, one of the same rank and another of a different one. The lowest winning combination is Jacks or better – a single pair that consists of at least Jacks. Players win a predetermined amount of money for each specific hand which depends on the winning combination and the bet they have placed. For instance, if they wager 5 coins which in most variations is the maximum bet that can be made, and if they end up with a Royal Flush, they will get about 4,000 coins. The payout for the winning combinations also varies slightly, depending on the particular version. This is the reason why players should always consider the payout percentage of the variation they are about to play in order to make sure its rules work in their favor. As already indicated, nowadays players have the chance to play a number of exciting variations of video poker and enjoy it in a completely different way. Each version has its own subtleties and additional rules and therefore, it is always a good idea to get familiar with them beforehand. For instance, some variations feature wild cards, whereas others such as Jacks or Better don’t. It should be also noted that the games that have such cards are played in a slightly different way. In most cases, the payouts for the winning combinations that feature wild cards are slightly altered as well. One of the things which should be taken into account when it comes to video poker with wild cards, is the minimum payout. While the standard lowest possible winning hand is a pair of Jacks, in such variations, the lowest winning combination is usually a pair of Kings or Aces. Thus, it is always a good idea if players have a look at the pay table, before playing a particular version as this way, they will prevent themselves from wagering too much money on unfavorable games. Even though such a small change of the rules might seem insignificant at first glance, it actually has a huge impact on the way players need to play in order to win consistently. Therefore, every time they try a new version, they should take their time to adjust their strategy accordingly. The new rules don’t necessarily work in favor of the casino or make the game harder. However, they certainly require a new approach and review of the respective strategy. Even though video poker is very similar to the standard poker, its rules have some significant differences that should be taken into account. In order to be able to fully enjoy the game, players should get familiar with the basic rules and the winning combinations for the respective variation they are about to play. There are also a number of efficient strategies which they can use in order to reduce the house edge and become consistent winners. Video poker is the perfect game for gamblers who like to not only try their luck but also put their skills and knowledge to the test. This is the reason why it has become one of the most popular casino games of all time as it enables players to have fun and win some extra cash.